I traditionally start every new year with a new sequence of articles for the blog...I rarely manage to complete a whole year worth of articles, but I always try to give it a good shot. Often the first couple of weeks get regular issues, then a week might get missed every now and then, I might try to catch up with a few weeks seeing double posts for the sequence...and if I get too far behind, I just give up. I did 52 articles for my "Game Mechani(sm) of the Week" series, I worked through the development of the "Hell on 8 Wheels" board game, but most other attempts just haven't seen it through. At the moment, I'm pondering what to do for my intended sequence for 2014. 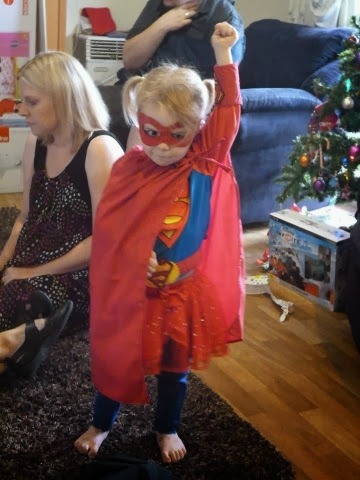 As a PS to my last post, I thought I'd just share our efforts to create the next generation of live-action roleplayers...we'll start them in the superhero genre and move on from there. Now to find a good system to teach them. Maybe, like the costumes, we'll make up a system from scratch. Happy Whatever Festival You Partake In!! I don't have much to add today, it's been too busy over the last couple of days with a combination of work and family stuff...still, I thought I'd take the time to wish everyone well. ...it's taken a while so far, and this is only the start of the project. To Patreon or not to Patreon? There's a great new funding platform called Patreon. It basically uses people to fund an artist to continue their work, to keep the motivation happening, and so that the funded artists no longer need to rely so much on day jobs...they can focus on their art. 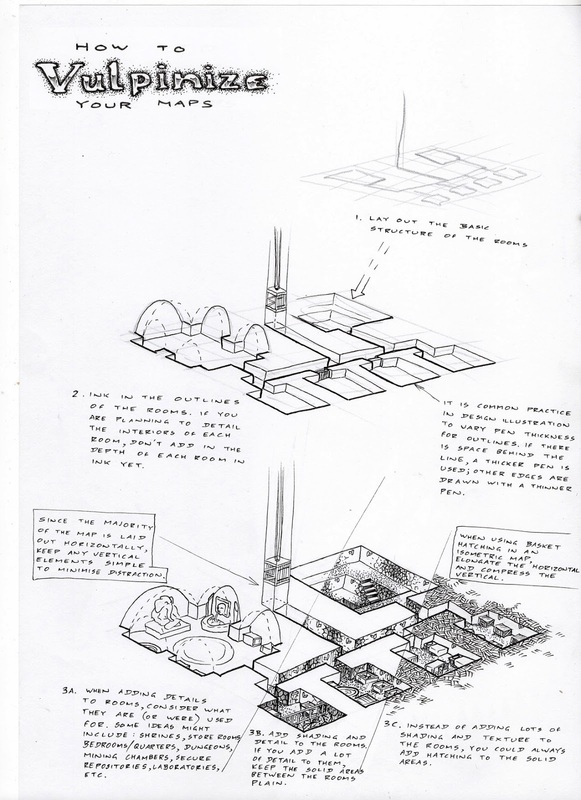 There are already a few great game designers who've taken to it, and a few map illustrators as well (i'm looking at you Dyson). I'm thinking that it might be a good way to keep motivated about map tutorials if I take on a Patreon account for myself...map tutorials will be released for free here on the blog, and maybe over on the Vulpinoid studios website. Any accumulated Patreon funds will go towards getting a print run happening for the final collection of tutorials. 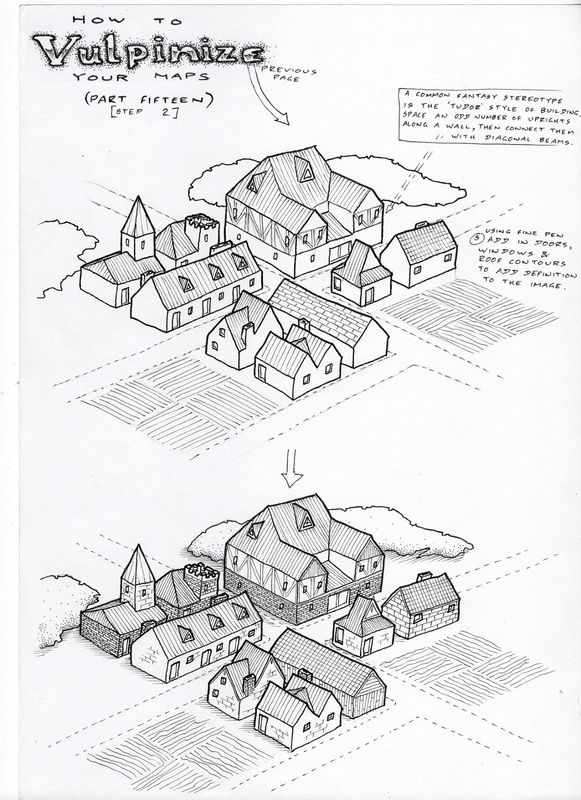 Throughout the development of the Walkabout roleplaying game, I've been seriously considering how settlements start from a tiny encampment, then gradually tend to grow larger and more prosperous, or dwindle and fade away (many settlements go through multiple phases of growth and contraction throughout their histories). 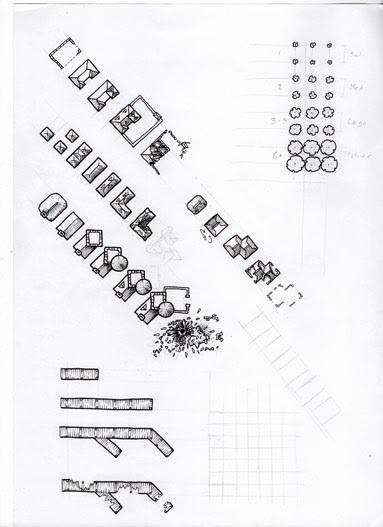 Since I've been drawing a lot of maps depicting post apocalyptic settlements, it has led me to develop certain patterns when building up an outpost of civilization for the characters to encounter in the game. Such outposts may begin as single buildings, but if people wish to remain in such locations they need something to keep them there...this might come in the form of trade, local resources or strategic importance for the settlement. This has basically been the way many villages, towns, and cities were founded. I was working on this commission over a month ago, when my scanner went down. As a result, I've had to wait until now, when I'm using my parents' scanner to digitize a whole lot of recent imagery. I'm not really happy with the way this one has turned out, so I've performed a few tricks to make it a bit better. Firstly, the image was drawn at A2 (420mm x 594mm) I had to scan it in four A4 passes, then use Photoshop to reassemble the final image. This always causes problems. Next, the edges of the A4 quarters became dimmed, dulled and slightly blurred along the middle joins because the excess paper caused the image to bend away from the scanning plate. To cover this, I've used stock footage of folded and slightly crumpled paper and a multiplied background for the image. Hopefully this gives it the vibe of a military map that might have been found in the pocket of a soldier and unfolded before characters go in for the mission. Sometimes I find one of my old notebooks and it has an illustration that inspires me in some way. Sometimes it's an illustration that I've looked at many times over the years...something that I really want to do something with, but something that hasn't found it's appropriate place yet. I just found one of those illustrations that I keep coming back to...and I still haven't thought of a project to attach it to...so I thought I'd share it with everyone. I feel like it should be connected to a game about conflicted realities, people who exist in the real world simultaneously with a dream world, or maybe a game about faith and insanity. I'm still not sure. This is the kind of stuff that most people don't really need to know when they draw maps. But if you think about the map rivers carve their way into the landscape, you begin to understand the terrain a bit better. The landscape isn't completely random, it is a developing ecosystem. Rivers carve into the continental landmass, creating valleys according to the types of rock they cross. 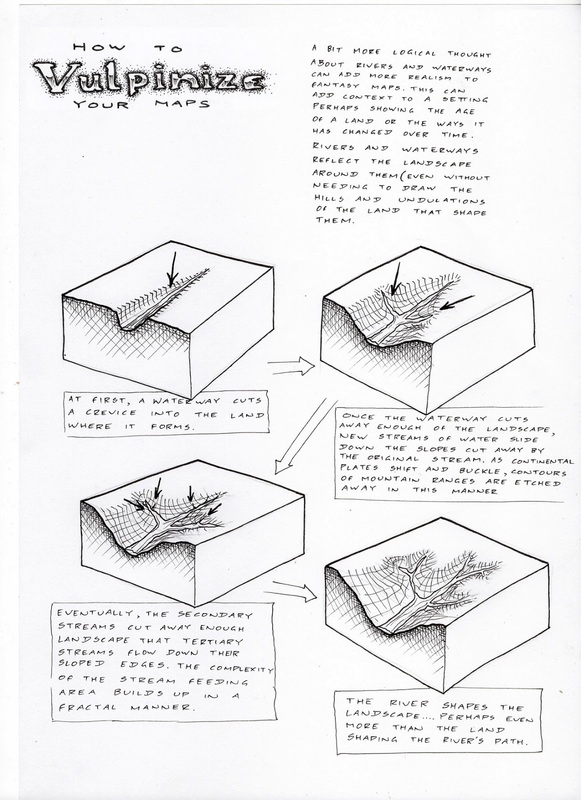 Soft rock might allow for deep gorges (or it might allow for wide floodplains, depending on the speed of the water)...hard rock might push water in other directions as it tends to follow the path of least resistance. Harder rock might push water around it, possibly forming islands in the course of a water-stream before it reforms on the other side. Let's get a bit more theoretical. 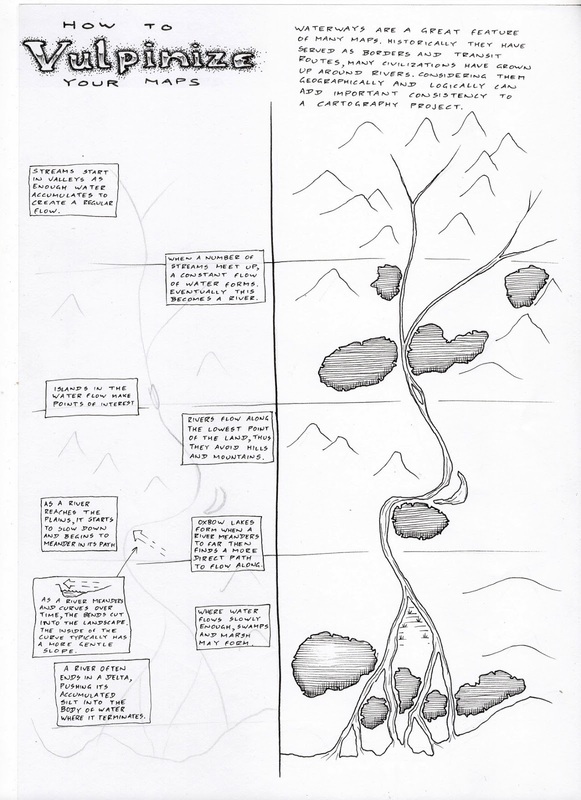 The next two tutorials focus on rivers, because I've seen far too many maps where the waterways just don't make logical sense in the context of their environments. A little bit of thought goes a long way...and another thing that might be useful to keep in mind is that traditional borders often follow rivers, don't make rivers follow unnatural borderlines (channels carved by intelligent societies are another matter for another tutorial). There is so much potential when it comes to drawing maps. You can draw straight plans, isometric style, perspective, mixed-perspective...these can be combined with varying types of shading, hatching, colouring...and can then be applied to a huge array of subject types...ships, urban areas, landscapes, regional areas, underground complexes...and there are so many more possibilities. 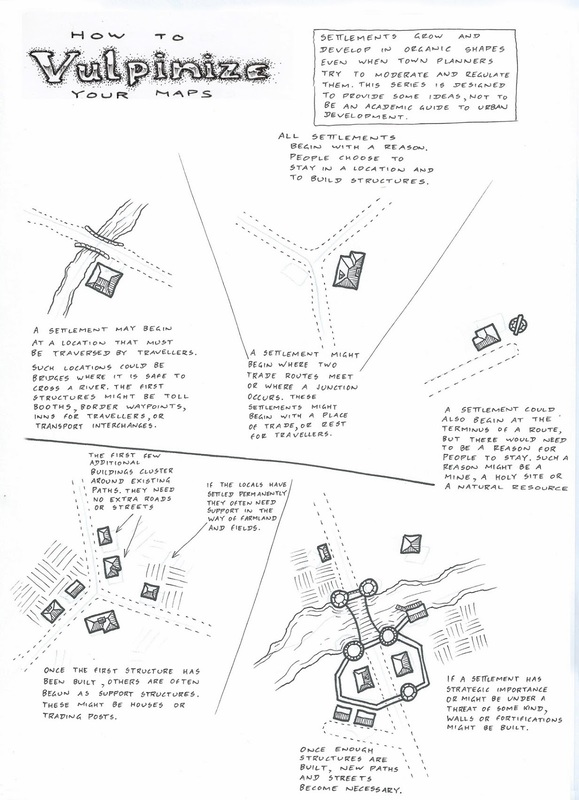 I can't hope to complete a fully comprehensive guide to every style of map, so the ongoing aim of these tutorials will be to produce my own version of various mapping styles, maybe provide a bit of theory that could help make maps "more realistic", and add a few ideas for any cartographers to add to their toolkit. Since we've missed a few weeks, there will be a couple of map tutorials each day over the next few days to help clear out the back log. I hope you don't mind. This is my attempt at replicating one of the common styles of map found in plenty of RPGs and fantasy novels in the 80s and 90s. 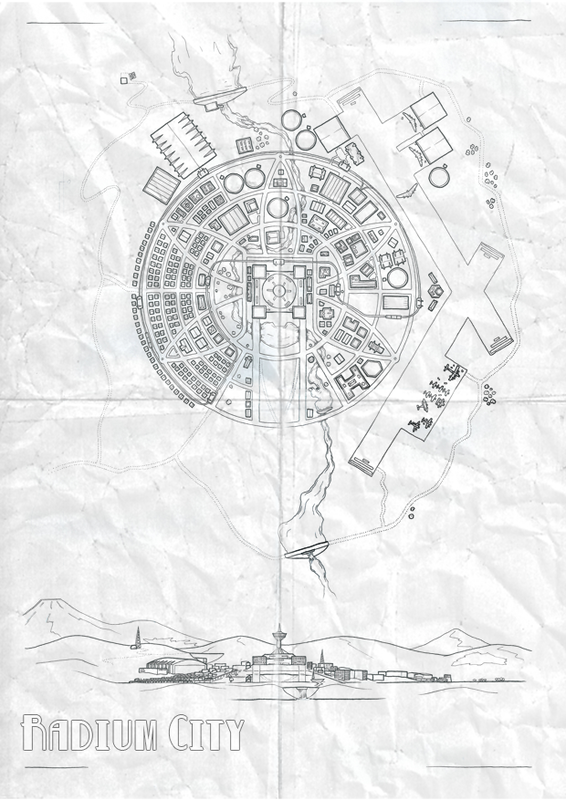 It plays with perspective, where the bottom of the map provides the close detail for the area where the action takes place, while the further territories gradually get less and less detailed and the context of the setting is placed in the wider world. 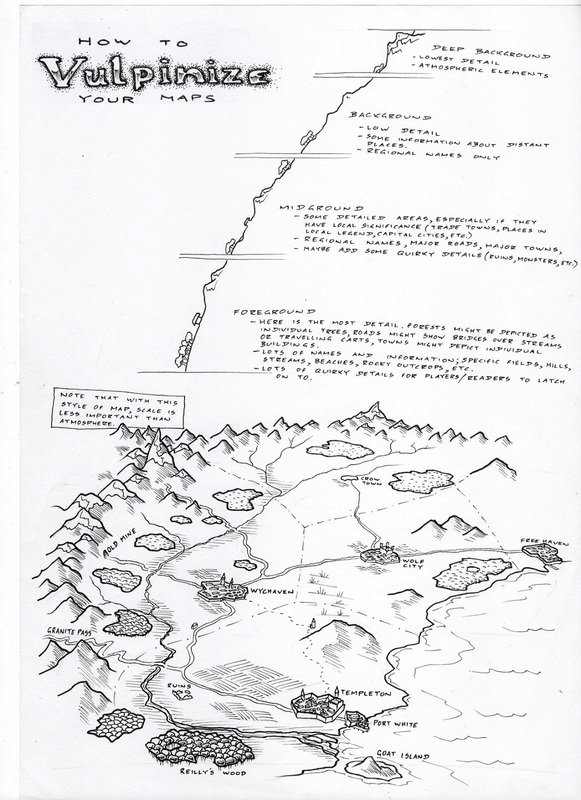 I drew plenty of maps like this is the mid 90s when I was running a few fantasy campaigns, but as I moved toward tales in modern settings and urban environments I stopped drawing in this style. It's nice to get back to it. It's taken over a month to get things back in working order, but finally the tutorials are back. I generally get 5000 views a month on this blog. I though that was a pretty healthy viewer count, some months (especially recently), I've received 10,000 views. I'd have thought that this would be enough to make a minor blip on the radar. So, when a list of 200 odd blogs is posted, with a quick review on each, I thought I might get a mention. Obviously not getting enough viewers ...oh well, back to work. I'll keep writing in cult-like obscurity. What happening with Rajah Spiny Rat? Several years ago, I wrote a game about sentient animals in a caste system, vaguely inspired by the early myths and caste system of Hinduism. It is called "Rajah Spiny Rat". Highly experimental and probably not very playable, but filled with great ideas that have filtered through into my more recent work. It has basically sat available in a few locations with neither promotion nor revision...but for some reason, every couple of weeks someone somewhere downloads a copy. It would be nice to think that there are other people around the world breathing life into this text, or maybe using it to inspire their own games. We have an abandoned brewery and distillery near my house. 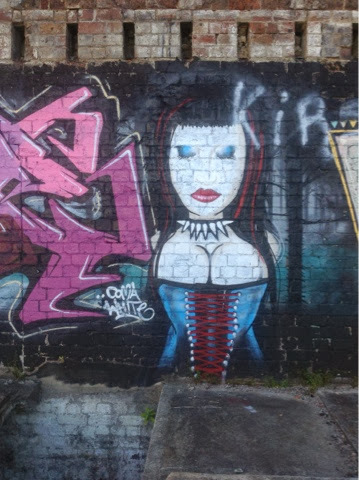 Sometimes, while looking for post apocalyptic inspiration for Walkabout, I go exploring. 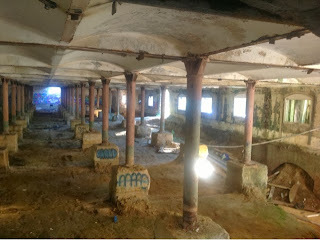 Here are a few shots I took on my last exploration of the site. A game where teams of fragile pilots use giant humanoid weapon platforms to fight against abominations from beyond the outer orbits of the solar system. No dice, no numbers (maybe minimal use of numbers would be better), psychodrama and intrigue galore. Just like an anime, just without the annoying character who everyone hates. This is a pre-release beta, only available on the blog. If anyone has any feedback on the game, it would be much appreciated. A refined version will hopefully be available by the end of the year over on RPGNow.